2 of our 3 American Bulldogs have horrible, oozing sores between their toes. We have tried everything! Grain Free dog food with protein sources that they have never experienced before...Oral Antibiotics...epson salt soaks...we have been through 3 different Vets. Nothing helps, and the poor guys are miserable! Any suggestions of what to do next are welcome. 1) The 2 dogs affected are the parents of the dog that doesn't have the sores. Sire is 7 years old. Dam is 3 or 4 years old & "puppy" is 2 1/2 yrs old. 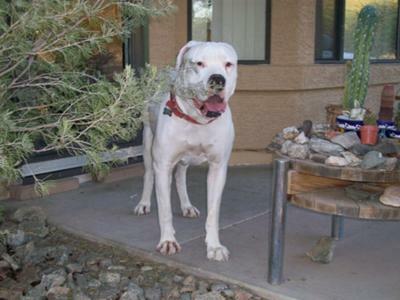 2) We live in the Phoenix, AZ area and our dogs do spend time outside in the summer. They do not have to stay out all day though (one who has the sores prefers to stay inside and avoid the heat, one does not) and their feet are not noticeably better or worse in the summer than in the winter. 3) The dog who does not have the sores does have chronic Valley Fever and is often on medication for it. 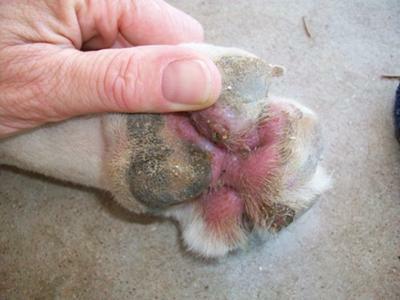 Skin conditions, especially those that affect the paws and toes are usually related to some type of contagious cause, such as a viral, bacterial or fungal infection. Problems that start at the paws, ears, or inguinal region (groin) not only indicates an infectious or contagious cause, but also represents that the patient has a depressed immune system. According to the information you provided and photographs provided, we can only propose a logical possibility. It is not possible to confirm the condition without detailed examination and laboratory tests if required. It appears that both dogs are primarily suffering from some type of fungal infection. Because you reside in an endemic area for fungal infections, problems with the feet are more common, e.g. the Arizona area is endemic to “Canine Valley Fever” and various integumentary (skin) canine fungal infections. imidazole group (Ketoconazole, Itraconazole, Miconazole), thus it is possibly protecting that dog against this condition. Additionally, it should be noted that in endemic areas' exposure to fungus, predisposing factors and certain response is not important. It is always required that in such areas, dogs at risk should be constantly monitored and preventive measures should be taken. Now, though we cannot confirm the exact cause without an in person examination, we have a strong opinion that it is a fungal infection, along with a possible secondary bacterial infection. It is recommended that you use a quality anti-fungal shampoo such as Malaseb Therapeutic Shampoo for bathing your dogs, especially the two with this problem. Use the shampoo until the condition resolves. Fair progress or improvement should appear within 2 weeks of use. Carefully follow the manufacturers instructions and make sure that you apply the shampoo on the sore dog toes. Additionally, we recommend that you should use some natural remedies to protect the paws, for cleaning the sores and for skin and immune health. For paw cleansing we suggest Clenzor, for paw health, we suggest Paw Paw, and to improve skin condition and the immune system, Skin and Coat Tonic. Regular use of these remedies will not only protect your dogs feet, but also will ensure improved health and immune status, which is required for dogs in the area you reside. At home, along with the aforementioned remedies and shampoo, home remedies such as soaking the paws in a mixture of 1 part cider vinegar to 1 part water can help to reduce the sores and inflammation. Also this tip can reduce the chance of any bacterial growth in between the toes. 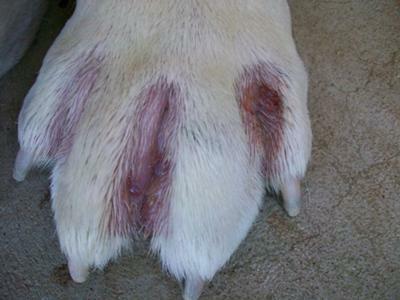 This condition, which seems to be a fungal infection should resolve in 2 – 4 weeks with the help of these suggestions, but in case, the condition does not resolve, or symptoms appear to be worsening with time, you should take your dogs for a detailed laboratory diagnosis, which includes culturing, isolation and detailed blood work for any other underlying cause, followed by the specific treatment recommended by your veterinarian. I have a 6yr old Pittie that started showing these same symptoms. I googled the symptoms and came up with Dog Apoty: open sores between toes, sometimes accompanied with a red rash around the groin area and head shaking. I thought he stepped on rocks or nails but it spread to all 4 paws. Took him to vet and told him about my google search. He agreed with "Atopy" and prescribed "Apoquel". It's doing the trick, but the vet said it's still new on the market so they have limited supply. Advised that I supplement the med with OTC Benadryl (adult strength). My pit is 85 lbs and the vet said up to 4 pills per day so I give him 1 Apoquel (prescription medication) in the am with 2 Benadryl's and then 2 more Benadryl's after work. His inner toes are still pink and tender, but no longer oozing blood from raw sores. hope this helps. Hi Zeus is 3 and like everyone else's dog has developed the interdigital cysts. My vet was no use BUT I have put him on a product called Billy No Mates, it's herbal and natural, put into food it helps with ticks, fleas, and other skin problems. I have also started using Athletes foot powder and I have to say he is 1000 times better. I am not saying it's a cure but it certainly is helping him, I also wash the feet in warm salt water once or twice a week. It's worth a try, he is so much happier and so am I. I love my boy and hated to see him limp around, I guess it's taken about a month maybe two but there are significant results. I hope this helps your dog. I have a boxer and he has this problem too, but what really helps is washing his paws with antibacterial shampoo and apply QUADRIDERM cream, don't forget to dry perfectly before applying it. My daughters American bull dog has had the same issues inflamed sores between his toes which seem to fluctuate in size, it looks the same as the photos posted above. We have had this investigated at considerable cost biopsy of area has shown a condition called interdigital furunculosis. This is caused by basically an ingrown hair which causes a reaction in his foot. The treatment involves a course of antibiotics tribrissen over a prolonged period six months for one week each month. This will hopefully get rid if any infection we have only just started this treatment so no conclusive results yet. This diagnosis does fit his condition as apart from the foot problems which generally only affects one particular foot he also does get the occasional lump or hot spot over his body for no particular reason. I have treated these previously with betadine which does seem to help. But using topical treatments alone will not improve this condition a systemic medication is needed too. He was on holistic dry food and I do give him fish oil and an egg daily to generally improve his skin condition. Hope this helps someone. Our black lab was diagnosed with spindle cell cancer, first showed itself in her front middle toe. We waited several months as we thought her toe had a mere infection and self treated her. Turns out, it was NOT an infection but cancer. Toe was removed. Cancer returned months later in her intestines. Could we have saved her if taken her to Vet earlier for toe check, aspiration, biopsy? My advice is to go to Vet for cancer check ASAP! Don't wait or self treat your pets. My Pug had an infection (either bacterial or fungal) between two toes and it appeared to have spread to the inside her ear. (From scratching her ear with her paw). I cleaned the ear with witch hazel and applied coconut oil twice a day. It went way in two days. I cleaned her paw with saline solution (dipped the whole paw in it) once a day and after it dried, I applied Manuka honey between the two infected toes. I did this for five days and it healed completely. The treatment did not cause her any discomfort and it worked fast. Maybe they are allergic to the flooring you have down in your home. I knew a lady who had a French Bulldog, and as soon as she put down a natural grass "carpet" called Sisal in her home, her dog developed foot sores. Do you have sisal in your home, or do your dogs walk across sisal in a welcome mat? I Hope and pray they get better. My Great Dane also has them on her back paws and front right elbow?? It was rare but after few trips to vet taking several types of antibiotics turned out that my bulldog came into contact with bacteria from feces somewhere in the neighborhood. My dog had a cut on bottom of front paw where the bacteria probably entered her paw. At first I tried soaking it with epsom salts, but this did not work. I did this for four days, finally took her to vet. He would not rule out amputation of the paw, so got advice from a veterinarian from Auburn university Glad I did because the Auburn vet turned out to be right. The problem was a bacteria from stepping in feces. The dogs paw got worse and worse before I took her to vet.I FORGOT THE NAME OF THE BACTERIA, BUT I WOULD NOT RULE IT OUT.My veterinarian said he had never seen a dogs paw in that bad of shape. He put her on the right antibiotic and luckily she still has four paws instead of three. Thanks to another vets opinion. Never rule out a second opinion even when it comes to a dogs health. The problem with my dog was related to one paw. not all four hope this helps. P.S. : My dog was in really bad shape. He would not eat or drink. Never delay taking your animal to the veterinarian. The longer you delay, the bigger the problem can get, resulting in higher medical expenses. Also, do not go and buy remedies you see on the computer, but see the veterinarian. Hi, I have a 4 year English bulldog, his paws are constantly red espically in the summer, tried everything on earth and spend all sorts of money and nothing helped, I just say where someone talked about vinegar and water, just tried it and keeping my finger crossed, thanks. My dogs has had Valley Fever in her lungs. She recovered and was doing great then she developed this rapidly growing lump on her rib cage. The vet really thought she had a mast cell tumor but the biopsy showed..........you guessed it......Valley Fever. She is back on the Fluconazole 200mg twice a day and had been doing GREAT but now she has sores that look identical to this inbetween two of her toes on one back foot. My guess is that it's the Valley Fever again. I'm going to call my vet. She probably will want to get another titer and up her dose to 2 pills a day. Take your dog to a good reputable vet as I have a rat terrier with same symptoms and she has Cushings Disease. It is the most heart breaking disease. don`t wait the longer the worse it gets. Sore between dog toes and Prednisone. My dog Sky, German Shepherd mix with Sharpei has the same problem. The vet started her with antibiotic, Clavamox for 10 days. The sores went away, but came back as soon as we stop giving her antibiotics. I took her to a second opinion vet who gave her prednisone to take for a long, long time. The sores went away but now a year later Sky has bladder cancer. I don't know if the steroid might have caused her cancer? Anyway, now she has bladder cancer and the sores between her paws are coming back. I live in Florida and my dog has free range of the yard. He is a terrier mix and has the bloody bumps between his toes. Im curious if it's his diet which he hates every dog food on the market, the bimonthly st. Augustine weed killer/fertilizer or the dirty yard. Can people please comment if their dogs have these bumps with/without the presence of the above environmental factors please. Our Jack Russell Terrier would get these sores between her toes in the spring and summer months. We finally attributed the sores to allergies since the sores disappeared in the winter (we live in Canada and ground is snow covered in the winter months). We treated our pet with Reactine (cetirizine hydrochloride) or the generic equivalent - 5mg/day for small dogs and 10mg/day for large dogs. Reactine is an over the counter antihistamine for the treatment of allergies in humans and it works for dogs also. Continuous allergic reactions in your dog may require lifetime usage but it is relatively inexpensive (especially the generic brand such as Walmart's Equate). Your dog will be ecstatic if it works. I have a dog also who has started to get those in between his toes what i did was buy some antiseptic peroxide and cleaned the infected area between his toes and then applied some antibiotic topical with a q-tip and do it every night . . . You could do it more periodically through out the day but its just easier when it bed time and it cleared right up within a couple of days. I once had this problem with my beagle... there were times where he would obsess with licking his a foot or two, he would lick them sopping wet, sometimes shoving his hole foot in his mouth, when making him stop he would wine and later in the day they would look like your picture above. Then go away after a day. One night i decided to take a second closer look when he first started, and while spreading his toes i found a red ant in between is toes. after reading about it, and finding an ant colony in the far corner of my yard, i realized this was the problem all along. I now periodically patrol yard and spray any ant colony that starts. My dog has not had the issue since. These pictures looked like my dog's paws as well. He had a yeast infection and a sore on the top of his paw. I suspect that part got infected. I tried everything under the sun and then wrote off meds and went natural. When disease/cancer is ruled out by tests, the key is a strong immune system. I cleaned his paws 2x daily by boiling water and letting it cool to room temperature. Poured it into a glass bowl - no rust/contamination and added white vinegar. Soaked his paws in it for 10 mins and blow-dried it. The key is to rinse and dry completely, so the yeast cannot grow. I then bought believe it or not Monistat-7 and treated his nail beds, paws/pads with it and wrapped a folded knapkin or gauze over his paw and then bandaged it with self-adhesive wrap found at Petco for 2.99 for a roll that last about a week. It worked; I just had to be diligent in keeping is paws dry if it rained or he walked on wet grass by blow-drying it. He's so good when I nurse him, so I'm fortunate in that sense. Good luck! Like N, I have a white pit bull (8 years old with the same problem), sore between the toes and loss of strenght in his hind quarters, we have him on joint medicine from the vet (4 about 5 days now), but I'm concerned we aren't doing the right thing and that this is an infection. Would fish oil on the food be a good choice with this? Yes, Frito feet, Melissa. My min pin (I was anonymous below and forgot to change it to my name) had that smell, too! I'm so happy fish oil worked for my Missy. She was so miserable. Cross paws but it has been over a year with no flares. Before, I couldn't keep hers feet calmed down for more than two weeks at a time. My min pin was having the same issue with her toes as well as her belly and rump area. She is a rescue dog but being an owner turn in, I had her history. She'd dealt with it for 8 yrs and had 8 yrs of off and on pred. I try to steer clear of pred since it is so damaging to the body. In her case, within a year of having her, she started into kidney failure, so pred isn't an option anyway. It seems environmental, but I'm not positive. Living in Kentucky, we sometimes have seasonal changes daily, it was hard to tell. So, just before I decided to go with an allergy panel, I added fish oil to her diet. (I started her on AllerG-3 but you don't have to buy "dog" fish oil). 1/2 squirt with breakfast (I use the pump bottle) and 1/2 squirt with supper. I hoped for some relief so, at the very least, she could go more than 2 months at a time without a secondary yeast infection which would require antibiotics. She has not had 1 flare up since. I'm not saying she never licks, but it's no more licking than that the normal min pin cleaning. She is not "eating" her feet as if she's after something. She has been "feet-eating" free since 2 weeks after implementing the fish oil in September of 2011. 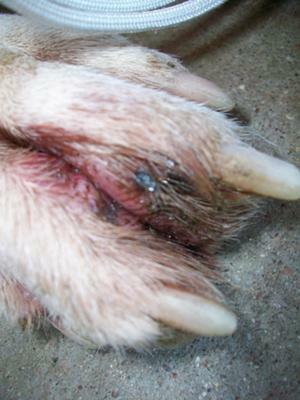 Dog paws fungal infection or inter digital cysts? We have 4 year old boxer that has identical issue. Her coat is absolutely beautiful but her paws are different story. We tried everything on this earth from simplicef antibiotic, ketoconazole,malaseb shampoo and pads, and several different shampoos, bactoderm cream,animax, prednisone, foot soaks (many kinds). Nothing helps. We did over 20 different allergy tests and she is not allergic on anything, we changed the food to raw, we added supplements. She has no other issues as we did all health testing on her. Spent small fortune to different dog dermatologists that gave us so many different diagnosis and ask to buy hundreds different medications and creams. Nothing helped. Prednisone is only thing that clears it up but once you stop it comes back with vengeance. We decided not to use steroids any more as on the long run affects liver. As of now we still did not find solution for her problem except that we really suspect considering it is very common in bully breads that her issue is really interdigital cysts which can be mistaken for foot fungus. We do know there is no permanent cure for that and nobody really knows why they occur. My dog is 7 years old and has the same problem every year.I got her when she was 9 weeks old. So this is not new to me. She was chewing her paws so bad they would bleed. She couldn't even walk the first time it happened her feet were so raw. She didn't want to get up and eat. We took her to the vet and it is a seasonal allergy. It always happens in the middle of August for her. We think it may be rag weed. Now I know what to watch for cause she starts shedding really bad for a couple days before she starts chewing her feet. We take her in to get a allergy shot every august about $38.00. Then we try to keep her in the house as much as possible for a few months. We also give her a bath once a week sometimes twice to keep it off her coat and skin as much as possible. If you can't see a vet right away i do suggest bathing your dog not with any smell good shampoo. Just oatmeal shampoo. Something more natural.If the dog just dosen't want a bath, you don't need to shampoo, just rise it off with room temp water so you get the skin cleaned off. Also give it a benadryl pill. I have given her one pill twice a day to help. I also buy hydrocortisone lotion or spray for dogs and put on her paws after a bath. I also have soaked her feet in epson salt when they were really bad. Not to cold or to hot of water (like room temp). Then put on the lotion. And yes your dogs feet do hurt. My dog growls and nips at me when i put on the lotion. That's the only time she ever acts that way. If you are scared of your dog use the spray. Usually after the shot she has alot of relief but we have to stay on everything else for about two months to keep it off the skin and she's back to normal and the feet are perfect again. WOW! Thanks to everyone for all the comments. When I first wrote this post, I thought that I might get 2 or 3 responses, not 10 or 20. Anyway, since writing it, we have found a vet that was able to help Rocket and his sore paws. After explaining to him that we had been through the whole special diet thing, and at least two full runs of antibiotics, he offered us two choices. The first option was for him to take cultures and do a detailed lab analysis, including full blood work. This would cost about $600 - $800. Or we could try Prednisone, which would not tell us anything about what is causing the sores, but might give Rocket some relief from them and would only cost about $30. As much as I would like to know the cause, we could not afford the lab work. So we went with the Prednisone. The vet had us give him 20 mgs twice a day for 7 days, then 20 mgs once a day for 7 days , then 20 mgs every other day for 7 days. It worked! The sores were gone by the end of the second 7 days. They have returned once since then, early this summer (it seems to be seasonal, which leads me to think that it is either a fungus or an allergy to something that grows around here in the summer), but now we have a strategy for fighting them. When the first sores show up we go through another 21 day run with the Prednisone and then we give him on 20 mg tablet every 3 days through the rest of the summer. This seems to be enough to keep the sores away for the rest of the season but because there are 3 days between each dose, we can take him back off of the medication in the fall, without having to detox him down. This is our second year of doing it this way and it works quite well. My girl is two. She also has them as i write this. Im gonna try the vinigar and water first. Then add a spray of alchol when and if they dont look so ozzie and open. Ill let yah know how it works. My other dog doesnt have them he ia a jug. A pug and jackrussel mix. Mine did the same I have a 4 yr old blue and the vet said an irritated pancreas. Possible causes are change in diet and human food get to a vet for the meds bout 70 dollars total and feed him boiled chicken and rice for a week if he starts to get better continue for one more week and no people food especially pork. I HAVE A PITBULL WITH SOME KIND OF INFECTION ON HIS PAWS THE BIGGEST THING THAT HAS ME WORRIED IS THAT IN THE LAST WEEK OR SO HE HAS TOTALLY LOST ALL STRENGTH IN HIS HIND LEGS. I HAVE TO HELP HIM UP AND DOWN STAIRS, HE HAS BEEN EXTREMELY DEPRESSED AND JUST WANTS TO LAY DOWN, HE LIMPS AFTER LAYING DOWN FOR A PERIOD OF TIME. I HAVE TAKEN HIM TO THE VET 3 TIMES AND I STILL HAVE NO ANSWERS AND ME AND MY PARENTS ARE GETTING MORE AND MORE WORRIED, DOES ANYONE HAVE ANY ADVISE? I also have an american bulldog 5yrs old same identical sores between his toes on all four feet. He also had two big sores in his groin which had went away do to antibiotics but uncertain if they are gone for good. He had also got sores under his coller that looked like a brown recluse had bit him and looked like the sores were eating him from the inside out our local vet refered to his problem stating our dog had something like lupis and infection is eating him from the inside out. Just curious if the arizona fokes hv had any luck with there bulldogs thank u and need help. how often do you soak the feet? when You soak the feel in 1 part Cider Vinegar & 1 part water how long should I soak them for and how often please let me know asap!! Thank you our dog is a large white american bulldog and he has had these soars for over a year and we have tried everything and nothing gets rid of them ughhhhhhh!! I thought I was looking at my dog's paw when I saw the pics. After 6 months of different meds and three sets of labs, he was diagnoised with a fungal infection. The infection reappears at least once a year. In fact, we are heading to the vet this morning for some more Keto. Good luck. Soak your dogs foot for a couple minutes in one part clorox to ten parts water. Rince very good with water. Should clear up in no time.